The weather is transitioning from cooler to warmer and this time of the year we need to pay special attention to our health. Food is our medicine. Shrimp Stuffed Tofu Soup is just the recipe to get you through the transitional weather months to keep you healthy. 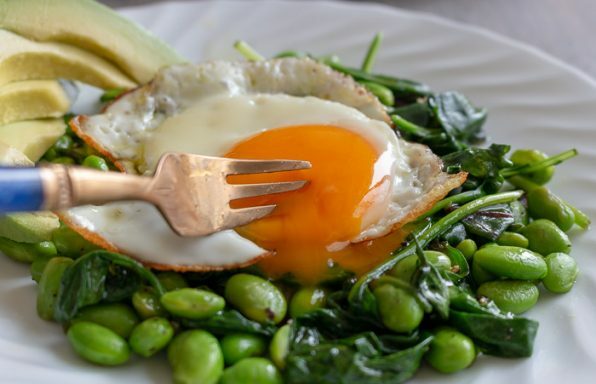 We like to eat what our body is craving and right now it is craving warmth and foods that are simply prepared and not fried and easy to digest. Shrimp Stuffed Tofu Soup is gluten-free, dairy free, diabetic friendly, cardiac friendly and low carb. 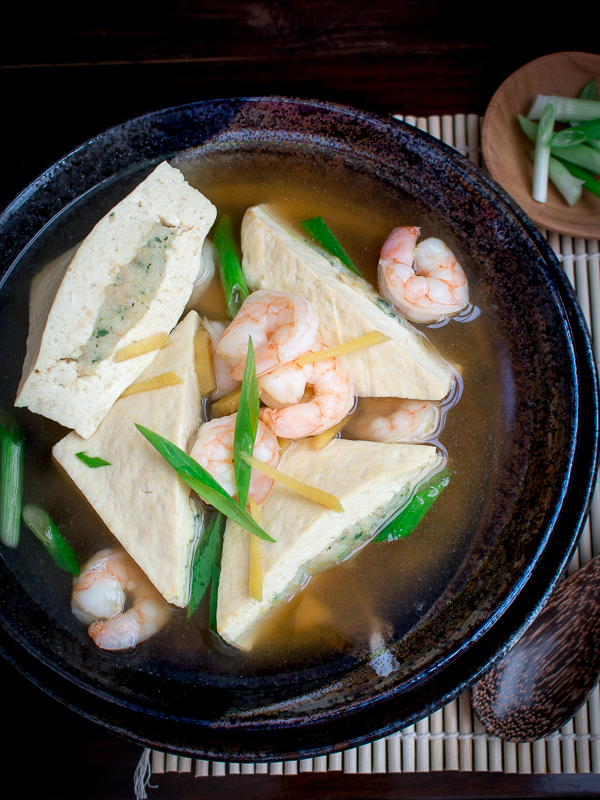 According to Traditional Chinese Medicine (TCM), the nourishing ginger broth is warming, the tofu is cooling and clears the toxins from the body, shrimp, scallions and garlic are warming so it is a nicely balanced soup. You are just going to love this simple clear broth of this Shrimp Stuffed Tofu Soup. It is made simply with just a few ingredients such as chicken or vegetable broth, light soya sauce (or tamari), ginger, white pepper and scallions. That’s it. It is so simple to make, you probably have everything in your pantry to make that right this very minute. 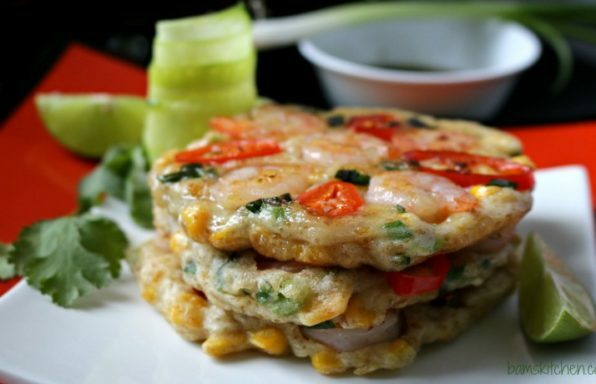 Have you ever had the Chinese shrimp stuffed tofu packets dim sum that are deep fried? We love the flavor but we do not like the grease. Shrimp Stuffed Tofu Soup is a healthier version of the Chinese Dim sum treat in a delicate soup broth. A few other Asian soup recipes that are perfect for that in between changing season weather is our Suan La Tang (Hot and Sour Soup), Five Spiced Beef Diakon Noodle Soup and Spicy Mung Bean Noodle Soup (Vegan). 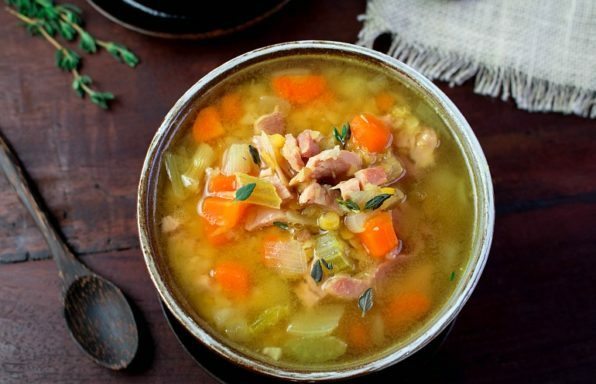 These soups are all warming and help fight dampness. Internal dampness that is ... the weather and our personal body make up have a lot to do with how your body responds to the environment. Keeping your body in balance is the best way to prevent illness. 1) Shrimp Stuffed Tofu Soup is simple to make. 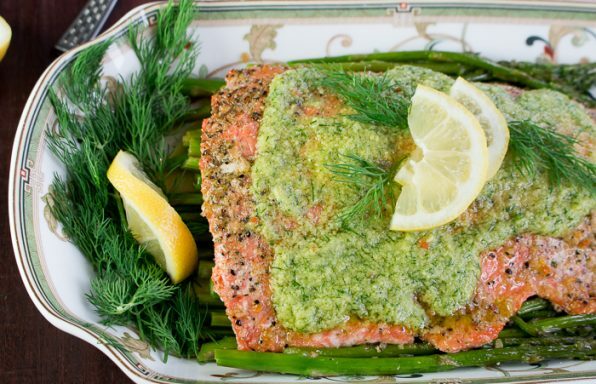 If you have a food processor to puree the shrimp and herbs into a paste, then the work is all done for you. 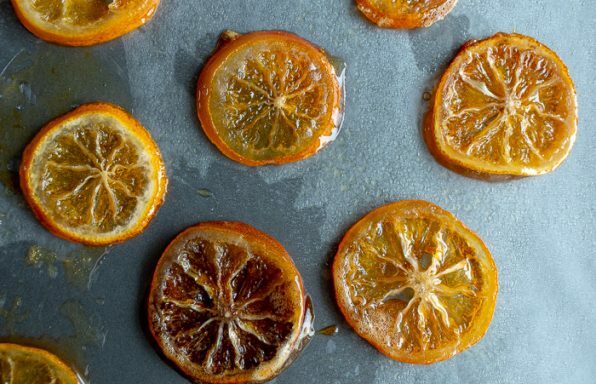 If not, this recipe is still simple. However, please allow for extra time as you will need to use your cleaver chopping knife to finely chop the shrimp up with the other ingredients. 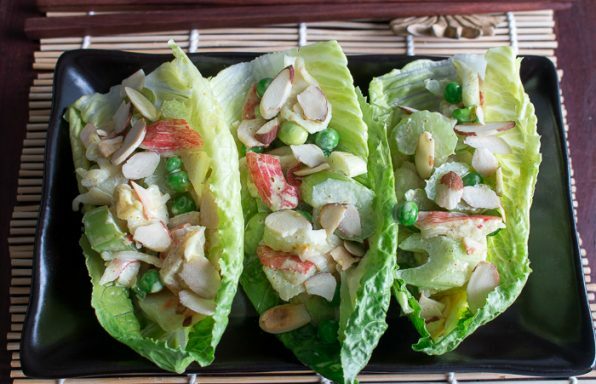 2) We used firm tofu to make this recipe. It must be FIRM or extra firm or otherwise the triangles will not hold shape during the cooking process. We used the House brand Firm tofu 14-ounce package. We cut it into 8 thick cut triangle slices. That is the most difficult part as it does require a little math… LOL to get them all approximately the same shape and size. Geometry was always a nightmare for us. If we could do it, don’t worry you will do fine. Give us algebra any day of the week. 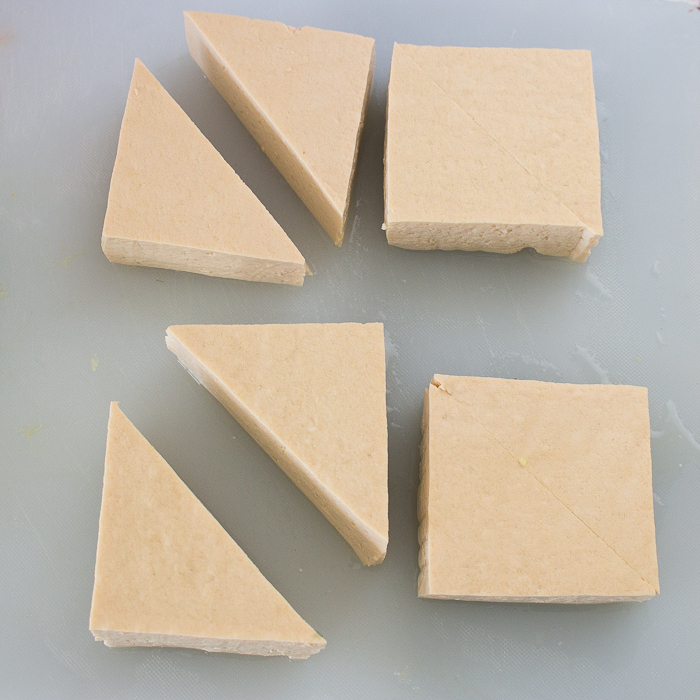 What we found out to work out best is to first cut your tofu into squares and then cut each square on an angle to make a triangle like in the photo below. 3) Once you have your geometry sorted out and have your tofu cut into triangles, make a slit with your knife on the LONG side of the triangle on the edge. Be careful to not cut the tofu all the way through. You just want to make a pocket to stuff your shrimp mixture. 4) Next, gently stuff your tofu with the shrimp and herb paste. DO NOT overstuff! If you do you will have a holy mess in your soup as the tofu will explode into your soup pot. (Don’t ask how we know that just please learn from our mistakes) The best judge for how much to add is about 1 tablespoon or less. You should be able to see the shrimp paste but the shrimp paste excess should be removed from the edge of the tofu. 5) You will create your broth and season it to taste before adding your shrimp stuffed tofu and then simmer for about 4 minutes. 6) Feel free to add any vegetables you like to this soup such as carrots, bok choy or whatever your little heart desires. We added a few extra plain shrimp just during the last minute of cooking. 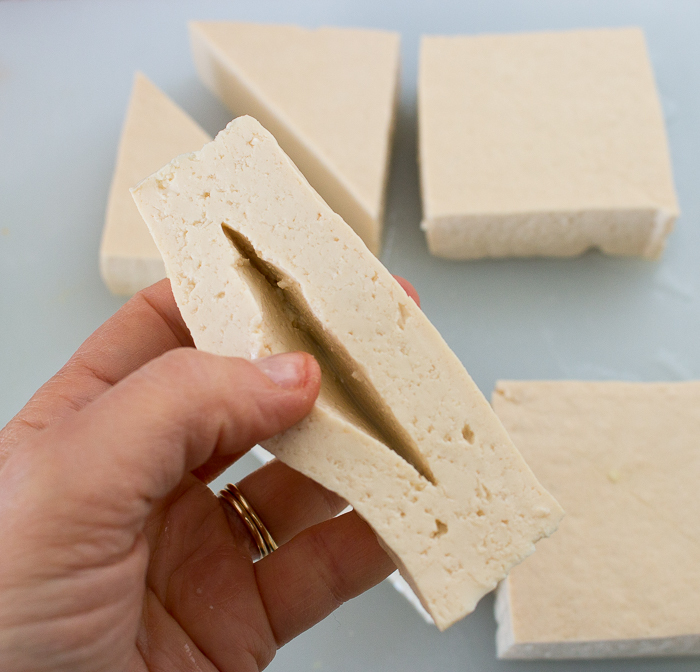 Tofu – 14 ounces FIRM drained and patted dry. 1Make the Shrimp mixture: Place 10 ounces of the prepared shrimp, Shaoxing wine (optional), garlic, cilantro, salt, white pepper, sesame oil and cornstarch in the food processor until well pureed. If you do not have a food processor just chop up everything finely and then stir in cornstarch to combine well. 2Drain your tofu and gently dab with a paper towel so it is easier for you to work with. First slice your tofu lengthwise in half. 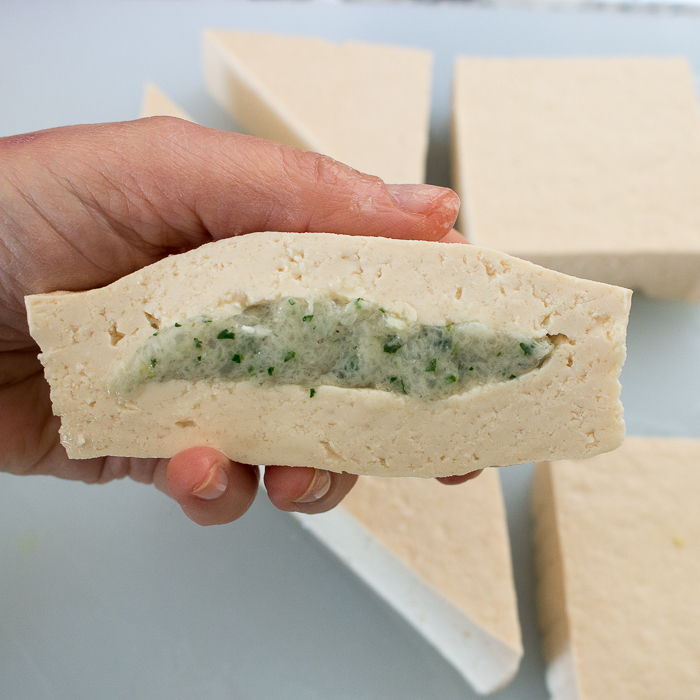 Then slice your tofu into 4 squares and then cut each square in half into triangle shape. We sliced ours into 8 thick triangles as if you get your triangles too small then difficult to stuff. Some Tofu come already cut into 4 square sections and if this is the case then all you need to do is to cut each square on an angle in half. 3Then make a slit into the long side of the tofu triangle along the edge, just large enough to place in the shrimp stuffing. Do not cut all the way through. Be gentle. 4Gently stuff each tofu triangle with a little less than a tablespoon of shrimp mixture. Do not overstuff! Just enough so that you can see the shrimp mixture but wipe off any excess and close gently with your fingers. Repeat with the rest of the tofu triangles. 5Make the Soup Broth: In a medium-large soup add about 8 ounces of chicken or vegetable broth, soy(tamari) sauce, white pepper, ginger and salt to taste. Bring to a boil and then back down to a gentle simmer. Adjust seasoning as needed. 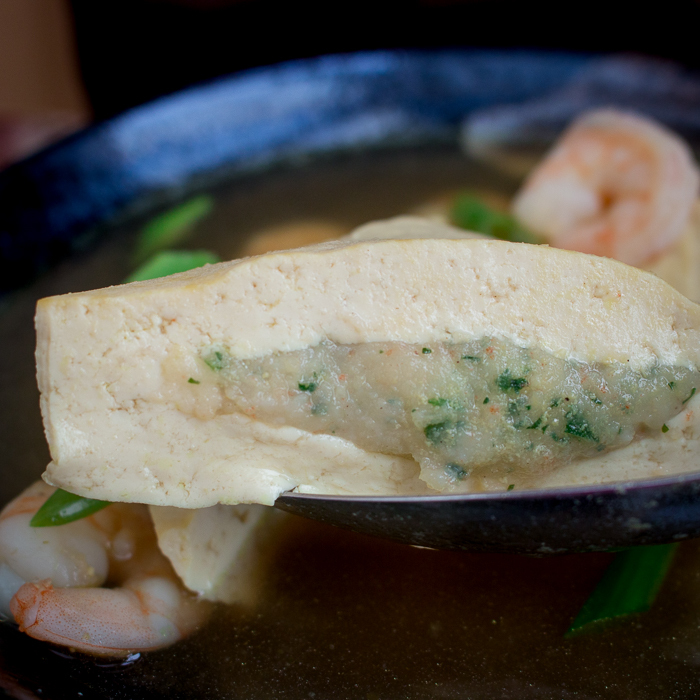 6Carefully add your stuffed shrimp tofu packets and simmer gently in the soup pot broth for about 4-5 minutes. In the last minute of cooking, add the remaining prepared shrimp and any quick cooking vegetables you like, ie bokchoy, and cook until shrimp are pink and cooked. Adjust seasoning as needed. 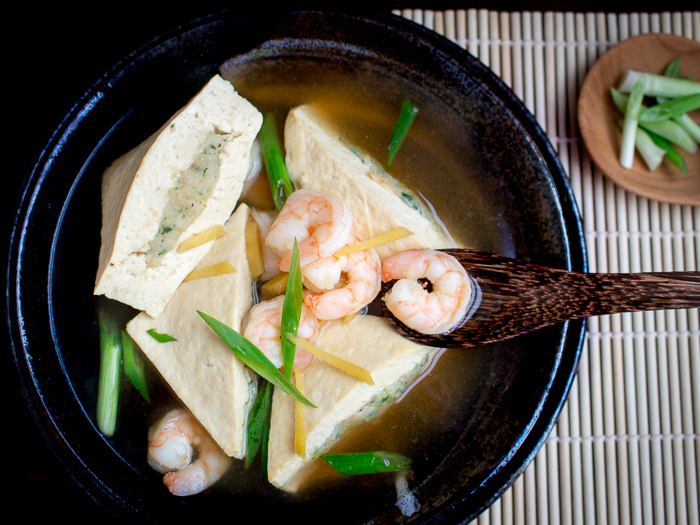 7Delicately remove your shrimp stuffed tofu packets from the soup pot and place into bowls. 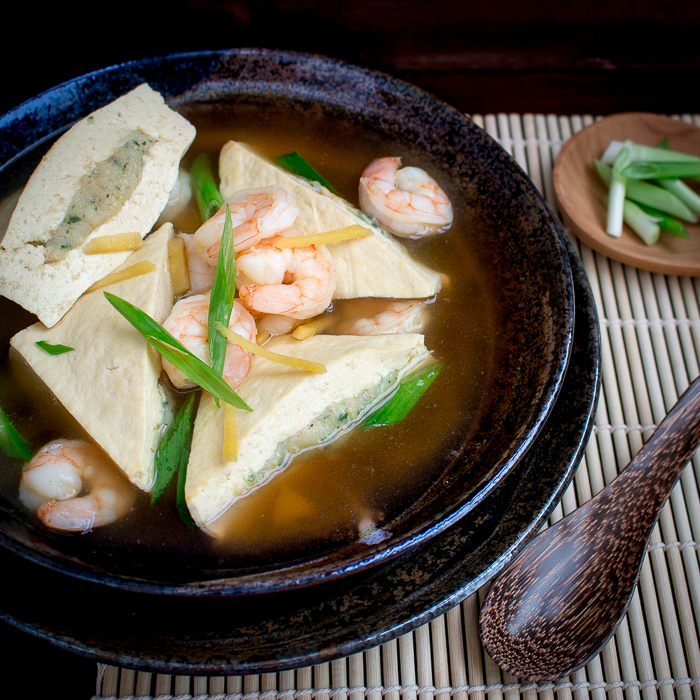 Ladle the delicious soup broth over the shrimp stuffed tofu packets and garnish with green onions.